Toilet training puppies can be frustrating, difficult and more than a little messy, but it’s an essential part of a dog’s development. Fortunately, there are lots of ways to toilet train your pup efficiently. Just like with many aspects of training your puppy, toilet training can begin as soon as you get your puppy. 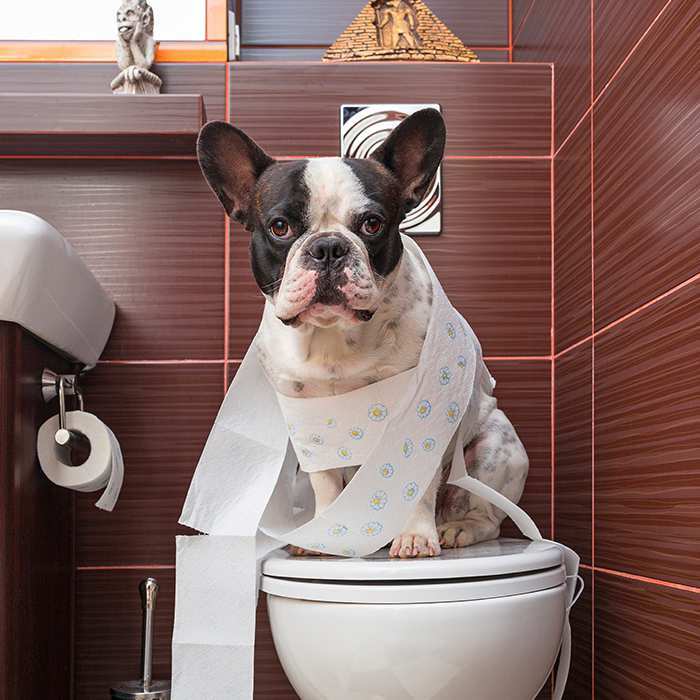 When toilet training your pup, you’ll need puppy pads or newspaper, paper towel, enzymatic stain cleaner, PATIENCE and of course really yummy treats to reward the right choice. Puppy training pads are a cheap and effective way of showing your pooch where they’re allowed to do their business. They work so well because they’re absorbent, odour-neutralising and they emit a special scent which attracts the puppy to pee or poo on the pad rather than elsewhere around the house. 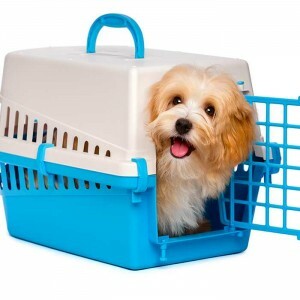 They’re available at pet shops and supermarkets but can also be purchased in bulk online. Cleaning up after your dog’s accidents is of utmost importance as otherwise your dog will smell all the pee places inside your house and will seek them out the next time they need to go. The best enzymatic stain cleaners can be purchased at pet stores or at your local vet. They eliminate the stain as well as the odours that are undetectable by humans. Products like tea tree oil, disinfectant, house hold cleaners or vinegar don’t work as reliably. At first (and even occasionally down the track) your puppy decide to do their business elsewhere (or even more annoyingly, just a few centimetres away from the puppy pad!). When this happens, quickly clean it up with paper towel and enzymatic stain cleaner. The cleaner will remove the smell so your dog is less likely to go in the same area again. As wee smell attracts your puppy to go back to the area, absorb the mistake onto a puppy pad to attract your puppy to go on to the wee pad. The most important thing when toilet training your dog is not to use negative reinforcement. Puppies are just like babies in this way – they don’t have any control over what they do, they just go when they need to. Getting angry at your puppy won’t help, as they don’t know what they’ve done wrong. The best way to react is to calmly clean up the mess. Reward your puppy big time when it wees on the area/ surface you want it to wee on. If you catch your dog in the event of an accident, don’t say anything, just clean it up. But make sure you watch out for the signs prior to your puppy doing a wee or a poo: stopping play or just waking up, moving away, sniffing around. Always reward your puppy immediately and with enthusiasm when it finishes its toileting outside. And again clean up the accident inside. Use treats your puppy loves and have them handy near the area you want your puppy to toilet. Dogs respond best to positive reinforcement, so be sure to reward them with super yummy treats and affection if they do the right thing (though, you will find that most puppies will choose the treat over affection!). 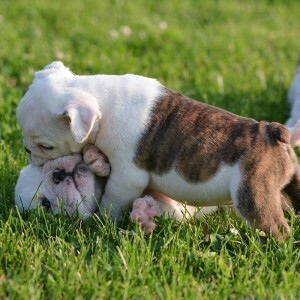 Your puppy will need to poo around 20-25 minutes after eating. If you see your pup walking around in circles while sniffing the floor, there’s a pretty good chance something’s about to happen. When you see this behaviour, take your dog immediately to its toilet area and reward it for doing its business there. Best is to take your puppy on a lead and guide it to the right spot as carrying him/her wont teach it how to get to the right toilet spot. If you are in doubt if your puppy will need to toilet, assume it will. Dogs learn through repetition, the more they toilet outside and get rewarded for it, the more they will learn that this is the right spot to do their business. Remember: housebreaking takes time and patience, so don’t expect miracles overnight. When your dog is completely toilet trained, you’ll appreciate that all the effort and hard work was worth it. Do clean up with enzymatic stain cleaner every time your puppy has an accident. Put a container with super yummy treats and a leash near the door or the place where you want your pup to do its business. This way you are ready to reward right there and then. The leash will come in handy when you want to show your pup where to toilet. Reward your dog with much fanfare for toileting in the right spot – make this the most exciting time of the day! Remember to reward immediately, within 3 seconds after your pup finishes toileting. If your puppy toilets at night, remove his/her access to water (if medically permitted). Make your poo walk boring. The movement will help to activate the digestive bowel system, however you want to make the walk boring so your puppy doesn’t get too distracted and forgets that it wanted to poop. Take your puppy for a final toilet walk just before you go to bed. Don’t give your dog the run of the house if you can’t supervise it. Limiting your dog’s access will help with toilet training.. Use a puppy playpen or a fenced off area when you can’t supervise your puppy. Don’t leave food out the entire day as scheduling feeding times will help you to get a schedule on pooping times. Never punish your dogs for accidents inside the house, even if you catch your puppy in the act.